Objective To assess the effect of tranexamic acid on blood transfusion, thromboembolic events, and mortality in surgical patients. Data sources Cochrane central register of controlled trials, Medline, and Embase, from inception to September 2011, the World Health Organization International Clinical Trials Registry Platform, and the reference lists of relevant articles. Study selection Randomised controlled trials comparing tranexamic acid with no tranexamic acid or placebo in surgical patients. Outcome measures of interest were the number of patients receiving a blood transfusion; the number of patients with a thromboembolic event (myocardial infarction, stroke, deep vein thrombosis, and pulmonary embolism); and the number of deaths. Trials were included irrespective of language or publication status. Results 129 trials, totalling 10 488 patients, carried out between 1972 and 2011 were included. Tranexamic acid reduced the probability of receiving a blood transfusion by a third (risk ratio 0.62, 95% confidence interval 0.58 to 0.65; P<0.001). This effect remained when the analysis was restricted to trials using adequate allocation concealment (0.68, 0.62 to 0.74; P<0.001). The effect of tranexamic acid on myocardial infarction (0.68, 0.43 to 1.09; P=0.11), stroke (1.14, 0.65 to 2.00; P=0.65), deep vein thrombosis (0.86, 0.53 to 1.39; P=0.54), and pulmonary embolism (0.61, 0.25 to 1.47; P=0.27) was uncertain. Fewer deaths occurred in the tranexamic acid group (0.61, 0.38 to 0.98; P=0.04), although when the analysis was restricted to trials using adequate concealment there was considerable uncertainty (0.67, 0.33 to 1.34; P=0.25). Cumulative meta-analysis showed that reliable evidence that tranexamic acid reduces the need for transfusion has been available for over 10 years. Conclusions Strong evidence that tranexamic acid reduces blood transfusion in surgery has been available for many years. Further trials on the effect of tranexamic acid on blood transfusion are unlikely to add useful new information. However, the effect of tranexamic acid on thromboembolic events and mortality remains uncertain. Surgical patients should be made aware of this evidence so that they can make an informed choice. We assessed the current evidence for the effect of tranexamic acid on blood transfusion, thromboembolic events, and mortality in surgical patients. To examine how the evidence has changed over time we used cumulative meta-analyses. Although we specified and documented the methods of the analysis and inclusion criteria for this systematic review in advance, the protocol was not registered. We searched for all randomised controlled trials that compared tranexamic acid with no tranexamic acid or placebo in elective and emergency surgery. No age restriction was applied. Potentially eligible trials were identified by searching the Cochrane central register of controlled trials (2011, issue 3), Medline (1950 to September 2011), and Embase (1980 to September 2011), using a combination of subject headings and text words to identify randomised controlled trials of any antifibrinolytic drug (see supplementary file for Medline search strategy). Searches were not restricted by language or publication status. To identify ongoing or unpublished trials we searched the WHO International Clinical Trials Registry Platform. We also examined the reference lists of eligible trials and reviews. Two authors independently screened the search output to identify records of potentially eligible trials, the full texts of which were retrieved and assessed for inclusion. Outcome measures of interest were the number of patients receiving a blood transfusion; the number of patients with a thromboembolic event (myocardial infarction, stroke, deep vein thrombosis, and pulmonary embolism); and the number of deaths. We contacted trial authors to obtain any missing outcome data. Overall, 127 articles1 6 7 8 9 10 11 12 13 14 15 16 17 18 19 20 21 22 23 24 25 26 27 28 29 30 31 32 33 34 35 36 37 38 39 40 41 42 43 44 45 46 47 48 49 50 51 52 53 54 55 56 57 58 59 60 61 62 63 64 65 66 67 68 69 70 71 72 73 74 75 76 77 78 79 80 81 82 83 84 85 86 87 88 89 90 91 92 93 94 95 96 97 98 99 100 101 102 103 104 105 106 107 108 109 110 111 112 113 114 115 116 117 118 119 120 121 122 123 124 125 126 127 128 129 130 131 describing 129 randomised controlled trials and totalling 10 488 patients were included; 5484 of these patients were allocated to tranexamic acid and 5004 to a control group (fig 1⇓). The median sample size was 60 (range 10-660) patients. In total, 126 (98%) trials were in elective surgery and three (2%) in emergency surgery. Eleven (8%) trials involved children. The authors of 86 trials were contacted for missing data, 39 of whom provided additional information. Data were available on blood transfusion from 95 (74%) trials, on myocardial infarction from 73 (56%), on stroke from 71 (55%), on deep vein thrombosis from 72 (56%), on pulmonary embolism from 66 (51%), and on mortality from 72 (56%). Seven (5%) trials did not present any data on the outcome measures of interest to this review or reported data in a format that was unsuitable for inclusion in the analyses. A further 14 ongoing trials were identified,132 133 134 135 136 137 138 139 140 141 142 143 144 145 with a median planned sample size of 130 patients. The 14 trials were in orthopaedic (n=5), cardiac (n=4), cranial (n=2), hepatic (n=1), ear, nose, and throat (n=1), and gynaecological (n=1) surgery. In 12 of the 14 trials blood transfusion was a main outcome measure. Overall, 44 (34%) trials were judged to be at low risk of bias for sequence generation and five (4%) to be at high risk (see the supplementary file for the risk of bias judgments for each methodological quality item for the included trials). The risk of bias in the remaining 80 (62%) trials was unclear owing to lack of information. Allocation was adequately concealed in 36 trials (28%) and inadequately concealed in six (5%), with the other 87 (67%) presenting insufficient information to allow judgment. Of the 95 trials with data on blood transfusion, 69 (73%) were judged at low risk of blinding, four (4%) at high risk, and 22 (23%) were unclear. The risk of bias for blinding was similar for thromboembolic outcomes (myocardial infarction, stroke, deep vein thrombosis, and pulmonary embolism), with about 70% judged to be at low risk, 5% at high risk, and 25% at unclear risk. 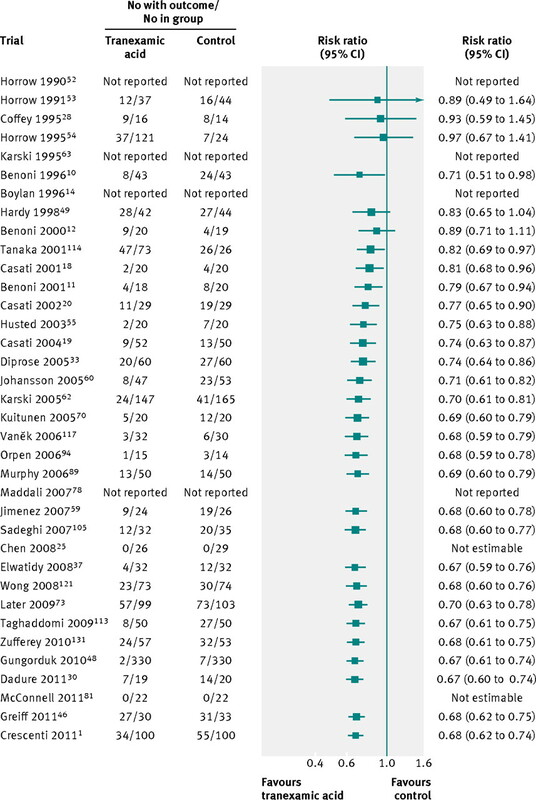 All 72 trials with mortality outcomes were judged to be at low risk of bias for blinding. Of 115 trials reporting eligible outcome data, 72 (63%) were at low risk of bias for incomplete outcome data, 17 (15%) at high risk, and 26 (23%) did not describe adequate information to permit judgment. Table 1⇓ presents the results of the meta-analysis. Data on blood transfusion were available for 95 trials, including a total of 7838 patients. Tranexamic acid reduced the probability of receiving a blood transfusion by 38% (pooled risk ratio 0.62, 95% confidence interval 0.58 to 0.65; P<0.001). When the analysis was restricted to the 32 adequately concealed trials involving 3408 patients, tranexamic acid reduced the risk of receiving a blood transfusion by 32% (0.68, 0.62 to 0.74; P<0.001). When the analysis was restricted to the 69 trials involving 5968 patients with adequate blinding for this outcome, tranexamic acid reduced the risk of blood transfusion by 37% (0.63, 0.59 to 0.68; P<0.001). The trials with blood transfusion data involved cardiac (n=42), orthopaedic (n=36), cranial and orthognathic (n=7), gynaecological (n=5), hepatic (n=2), urological (n=2), and vascular (n=1) surgery. Blood transfusion was statistically significantly reduced in cardiac, orthopaedic, cranial and orthognathic, hepatic, and urological surgery (table 2⇓). The pooled estimates for blood transfusion were consistent with a reduction in the tranexamic acid group among trials in vascular and gynaecological surgery, although the results were imprecise. There was moderate heterogeneity in magnitude of the effects of tranexamic acid by type of surgery, although the direction of the effects was largely consistent. There was uncertainty about the effect of tranexamic acid on myocardial infarction (risk ratio 0.68, 95% confidence interval 0.43 to 1.09; P=0.11), stroke (1.14, 0.65 to 2.00; P=0.65), deep vein thrombosis (0.86, 0.53 to 1.39; P=0.54), and pulmonary embolism (0.61, 0.25 to 1.47; P=0.27). 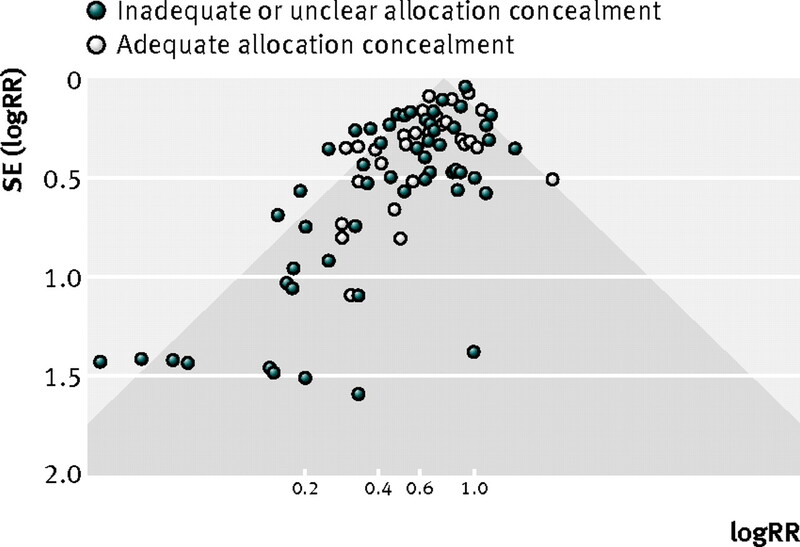 The results were similar when the analyses were restricted to trials with adequate allocation concealment and those with blinded outcome assessment. Fewer deaths occurred in the tranexamic acid group (risk ratio 0.61, 95% confidence interval 0.38 to 0.98; P=0.04), although there was uncertainty about this effect, particularly when the analysis was restricted to the 28 trials with adequate concealment (0.67, 0.33 to 1.34; P=0.25). 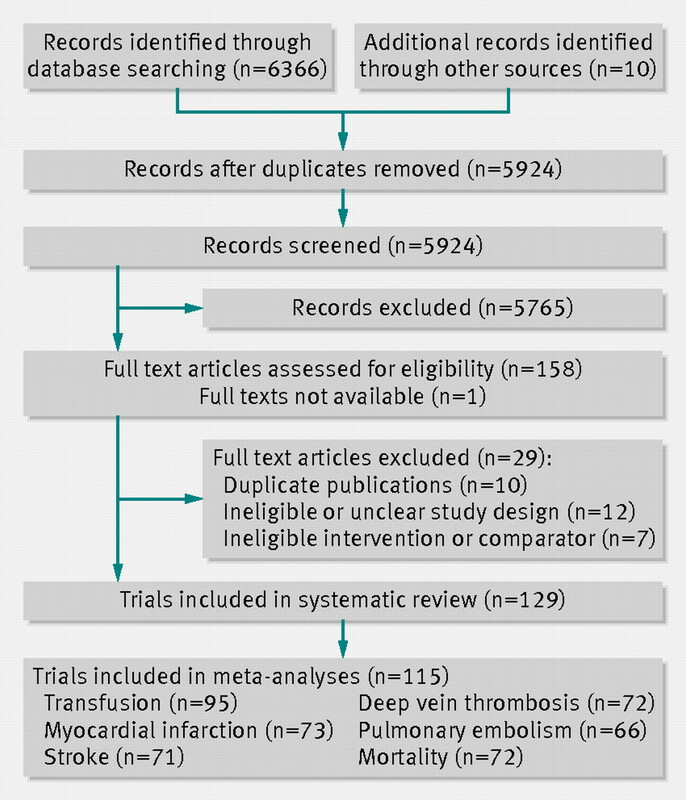 The supplementary file shows the results of the cumulative meta-analysis of the 95 trials with data on blood transfusion. A statistically significant effect of tranexamic acid on blood transfusion was first observed after publication of the third trial in 1993 (0.59, 0.43 to 0.80; P=0.001). Although subsequent trials have increased the precision of the point estimate, no substantive change has occurred in the direction or magnitude of the treatment effect. Figures 2-4⇓ ⇓ ⇓ shows the cumulative meta-analyses of the effect of tranexamic acid on blood transfusion, myocardial infarction, and mortality among the trials with adequate allocation concealment. A statistically significant effect of tranexamic acid on blood transfusion was consistently observed after publication of the 10th trial in 2001. Inspection of the funnel plot (fig 5⇓) for the outcome blood transfusion suggested the presence of small study effects favouring tranexamic acid. The other outcomes showed no clear asymmetry in the funnel plots. Between 1994 and 2011, 30 systematic reviews have been published on the effects of tranexamic acid in surgery.2 89 146 147 148 149 150 151 152 153 154 155 156 157 158 159 160 161 162 163 164 165 166 167 168 169 170 171 172 173 174 175 Assuming a 12 month publication time lag, 98 of the 116 (84%) included trial reports published as full journal articles were published when at least one systematic review was available. Examination of the reference lists of these reports indicated that 45 (46%) did not cite any of the available systematic reviews. The authors of two of the 116 trial reports had carried out a systematic review and presented the findings within the final trial publication. Reliable evidence that tranexamic acid reduces blood transfusion in surgical patients has been available for many years. The treatment effect varies somewhat according to the type of surgery, but the effect is consistently large and remains so when the analysis is restricted to trials with adequate allocation concealment. The effect of tranexamic acid on thromboembolic events and mortality has not been adequately assessed by clinical trials in surgery and remains uncertain. In view of the evidence, those planning further placebo controlled trials should explain why they think that tranexamic acid might not reduce the risk of blood transfusion in the particular group of surgical patients under consideration and focus their efforts on resolving the uncertainties about the effect of tranexamic acid on thromboembolic events and mortality. The inferences that can be made from the included trials depend on their quality, and many had methodological limitations. However, the large and statistically significant effect on blood transfusion remained when the analysis was restricted to trials with adequate allocation concealment and with adequate blinding. We systematically searched a range of databases for published and unpublished trials. However, we cannot exclude the possibility that some were missed. Indeed, the observed asymmetry in the funnel plot could be explained by publication bias. If many unpublished trials show little or no effect of tranexamic acid on blood transfusion, then this meta-analysis may have overestimated the treatment effect. Although some degree of overestimation is likely, it seems improbable that publication bias could account for all of the observed effect. Although mortality and thromboembolic outcomes showed no obvious asymmetry in the funnel plots, publication and other reporting biases remain a potential threat to the validity of the effect estimates. Mortality data were reported in only a third of the included trials, and less than half reported data on myocardial infarction, stroke, deep vein thrombosis, and pulmonary embolism. Inadequate reporting of adverse events is not unusual in reports of clinical trials and hinders the reliable estimation of treatment effects.176 177 After contacting the trial authors we obtained some missing data and were able to include mortality data for three quarters of the included trials and data on myocardial infarction, stroke, deep vein thrombosis, and pulmonary embolism for about half of the trials. However, the effect of outcome reporting bias in this review remains open to question. Even if there was no significant bias, the precision of the estimates is low and the data are compatible with either a moderate increase or a moderate decrease in the risk of thromboembolic events. The evidence in this review suggests that the uncertainty about the effect of tranexamic acid on blood transfusion in surgical patients was resolved over a decade ago; however, uncertainties about its effect on thromboembolic events and mortality persist. Despite this, trials of tranexamic acid continue to assess the effect on blood transfusion. One reason may be a reluctance to generalise the evidence across surgery types, although there is no evidence that the relative effect of tranexamic acid on blood transfusion varies by type of surgery. A second reason may be that trialists are unaware of the existing evidence when initiating a new trial. Our observation that only half of the trials cited one or more of the available systematic reviews and just two carried out their own systematic review, does suggest that many trialists are indeed failing to adequately consider the existing evidence. Further small trials of tranexamic acid in surgical patients considered in isolation will not resolve the uncertainties about the effects on thromboembolic events and mortality. Because thromboembolic events are relatively rare, such trials lack statistical power to detect clinically important increases in risk, and a meta-analysis of small trials remains vulnerable to publication bias. The ongoing Aspirin and Tranexamic Acid for Coronary Artery Surgery trial179 with a planned sample size of 4300 high risk patients undergoing coronary artery surgery, should contribute importantly to resolving the uncertainty about the effect of tranexamic acid on mortality and thromboembolic events in this specific group. We urge investigators involved in all ongoing trials of tranexamic acid in surgery to collect data on thromboembolic events and mortality for inclusion in a prospective meta-analysis until the uncertainties are resolved. However, a need remains for a large pragmatic clinical trial of the effect of routine use of tranexamic acid in a heterogeneous group of surgical patients. The possibility that tranexamic acid might reduce mortality without any increase in the risk of thromboembolic events would justify the effort and expenditure involved. We thank Karen Blackhall for designing and performing the bibliographic database searches; Mercedes Hernandez for help in contacting authors and data extraction; Joey Kwong, Gabi Meineke, Daniella Manno, Ayumi Naito, and Emma Sydenham for assisting with the translation of non-English language papers; the following trial authors who responded to our requests for further information; J Alvarez, G Angelini, G Benoni, C Chen, W Choi, C Dadure, P Durán de la Fuente, A Eajazi, S Elwatidy, J Engel, L Eslamian, J Field, B Garg, J Gill, S Goobie, G Greiff, J Guay, J Hardy, H Husted, J Jimenez Rivera, T Johansson, P Kakar, A Later, J McConnell, F Moret, D Neilipovitz, R Niskanen, P Patel, H Pleym, A Rannikko, M Seear, L Tritapepe, T Tsusumimoto, T Vanĕk, G Wang, N Webster, J Wong, C Wu, and J Yepes. Contributors: KK and IR conceived the study. KK is guarantor. IR is a National Institute for Health Research senior investigator. KK, IR, PE, PP, and HS screened the search output. KK extracted data and carried out the analyses. KK and IR wrote the manuscript with contributions from PP, PE, and HS. The final version was approved by all authors. Funding: This study received no external funding. Crescenti A, Borghi G, Bignami E, Bertarelli G, Landoni G, Casiraghi GM, et al. Intraoperative use of tranexamic acid to reduce transfusion rate in patients undergoing radical retropubic prostatectomy: double blind, randomised, placebo controlled trial. BMJ2011;343:d5701. Henry DA, Moxey AJ, Carless PA, O’Connell D, McClelland B, Henderson KM, et al. Anti-fibrinolytic use for minimising perioperative allogeneic blood transfusion. Cochrane Database Syst Rev2001;1:CD001886. Higgins J, Green S. Cochrane handbook for systematic reviews of interventions. Wiley, 2008. Stata Statistical Software: Release 11. College Station, TX: StataCorp LP [program], 2009.
Review Manager (RevMan) [Computer program] Version 5.1. Copenhagen: The Nordic Cochrane Centre, The Cochrane Collaboration, 2011. Alvarez JC, Santiveri FX, Ramos I, Vela E, Puig L, Escolano F. Tranexamic acid reduces blood transfusion in total knee arthroplasty even when a blood conservation program is applied. Transfusion2008;48:519-25. Andreasen JJ, Nielsen C. Prophylactic tranexamic acid in elective, primary coronary artery bypass surgery using cardiopulmonary bypass. Eur J Cardiothorac Surg2004;26:311-7. Armellin G, Casella S, Guzzinati S, Pasini L, Marcassa A, Giron G. Tranexamic acid in aortic valve replacement. J Cardiothorac Vasc Anesth2001;15:331-5. Auvinen O, Baer GA, Nordback I, Saaristo J. Antifibrinolytic therapy for prevention of hemorrhage during surgery of the thyroid gland. Klin Wochenschr1987;65:253-5. Benoni G, Fredin H. Fibrinolytic inhibition with tranexamic acid reduces blood loss and blood transfusion after knee arthroplasty: a prospective, randomised, double-blind study of 86 patients. J Bone Joint Surg Br1996;78:434-40. Benoni G, Fredin H, Knebel R, Nilsson P. Blood conservation with tranexamic acid in total hip arthroplasty: a randomized, double-blind study in 40 primary operations. Acta Orthop Scand2001;72:442-8. Benoni G, Lethagen S, Nilsson P, Fredin H. Tranexamic acid, given at the end of the operation, does not reduce postoperative blood loss in hip arthroplasty. Acta Orthop Scand2000;71:250-4. Blauhut B, Harringer W, Bettelheim P, Doran JE, Späth P, Lundsgaard-Hansen P. Comparison of the effects of aprotinin and tranexamic acid on blood loss and related variables after cardiopulmonary bypass. J Thorac Cardiovasc Surg1994;108:1083-91. Boylan JF, Klinck JR, Sandler AN, Arellano R, Greig PD, Nierenberg H, et al. Tranexamic acid reduces blood loss, transfusion requirements, and coagulation factor use in primary orthotopic liver transplantation. Anesthesiology1996;85:1043-8; discussion 30A-31A. Brown RS, Thwaites BK, Mongan PD. Tranexamic acid is effective in decreasing postoperative bleeding and transfusions in primary coronary artery bypass operations: a double-blind, randomized, placebo-controlled trial. Anesth Analg1997;85:963-70. Bulutcu FS, Ozbek U, Polat B, Yalçin Y, Karaci AR, Bayindir O. Which may be effective to reduce blood loss after cardiac operations in cyanotic children: tranexamic acid, aprotinin or a combination? Paediatr Anaesth2005;15:41-6. Caglar GS, Tasci Y, Kayikcioglu F, Haberal A. Intravenous tranexamic acid use in myomectomy: a prospective randomized double-blind placebo controlled study. EurJ Obst, Gynecol, Reprod Biol2008;137:227-31. Casati V, Bellotti F, Gerli C, Franco A, Oppizzi M, Cossolini M, et al. Tranexamic acid administration after cardiac surgery: a prospective, randomized, double-blind, placebo-controlled study. Anesthesiology2001;94:8-14. Casati V, Della Valle P, Benussi S, Franco A, Gerli C, Baili P, et al. Effects of tranexamic acid on postoperative bleeding and related hematochemical variables in coronary surgery: comparison between on-pump and off-pump techniques. J Thorac Cardiovasc Surg2004;128:83-91. Casati V, Sandrelli L, Speziali G, Calori G, Grasso MA, Spagnolo S. Hemostatic effects of tranexamic acid in elective thoracic aortic surgery: a prospective, randomized, double-blind, placebo-controlled study. J Thorac Cardiovasc Surg2002;123:1084-91. Castelli G, Vogt E. [Result of an antifibrinolytic treatment using tranexamic acid for the reduction of blood-loss during and after tonsillectomy]. [German]. Schweiz Med Wochenschr1977;107:780-4. Chauhan S, Bisoi A, Kumar N, Mittal D, Kale S, Kiran U, et al. Dose comparison of tranexamic acid in pediatric cardiac surgery. Asian Cardiovasc Thorac Ann2004;12:121-4. Chauhan S, Bisoi A, Modi R, Gharde P, Rajesh MR. Tranexamic acid in paediatric cardiac surgery. Indian J Med Res2003;118:86-9. Chauhan S, Das SN, Bisoi A, Kale S, Kiran U. Comparison of epsilon aminocaproic acid and tranexamic acid in pediatric cardiac surgery. J Cardiothorac Vasc Anesth2004;18:141-3. Chen CC, Wang CC, Wang CP, Lin TH, Lin WD, Liu SA. Prospective, randomized, controlled trial of tranexamic acid in patients who undergo head and neck procedures. Otolaryngol Head Neck Surg2008;138:762-7. Choi WS, Irwin MG, Samman N. The effect of tranexamic acid on blood loss during orthognathic surgery: a randomized controlled trial. J Oral Maxillofac Surg2009;67:125-33. Claeys MA, Vermeersch N, Haentjens P. Reduction of blood loss with tranexamic acid in primary total hip replacement surgery. Acta Chir Belg2007;107:397-401. Coffey A, Pittmam J, Halbrook H, Fehrenbacher J, Beckman D, Hormuth D. The use of tranexamic acid to reduce postoperative bleeding following cardiac surgery: a double-blind randomized trial. Am Surg1995;61:566-8. Corbeau JJ, Monrigal JP, Jacob JP, Cottineau C, Moreau X, Bukowski JG, et al. [Comparison of effects of aprotinin and tranexamic acid on blood loss in heart surgery]. [French]. Ann Fr Anesth Reanim1995;14:154-61. Dadure C, Sauter M, Bringuier S, Bigorre M, Raux O, Rochette A, et al. Intraoperative tranexamic acid reduces blood transfusion in children undergoing craniosynostosis surgery: a randomized double-blind study. Anesthesiology2011;114:856-61. Dalmau A, Sabaté A, Acosta F, Garcia-Huete L, Koo M, Sansano T, et al. Tranexamic acid reduces red cell transfusion better than epsilon-aminocaproic acid or placebo in liver transplantation. Anesth Analg2000;91:29-34. Demeyere R, Bosteels A, Arnout J, Gasthuisberg UV. Comparison of the effects of tranexamic acid, aprotinin and placebo on blood conservation, fibrinolysis and platelet function with extensive heart surgery. Crit Care2006;10(suppl 1). Diprose P, Herbertson MJ, O’Shaughnessy D, Deakin CD, Gill RS. Reducing allogeneic transfusion in cardiac surgery: a randomized double-blind placebo-controlled trial of antifibrinolytic therapies used in addition to intra-operative cell salvage. Br J Anaesth2005;94:271-8. Dryden PJ, O’Connor JP, Jamieson WR, Reid I, Ansley D, Sadeghi H, et al. Tranexamic acid reduces blood loss and transfusion in reoperative cardiac surgery. Can J Anaesth1997;44:934-41. Durán de la Fuente P, García-Fernández J, Pérez-López C, Carceller F, Gilsanz Rodríguez F. [Usefulness of tranexamic acid in cranial remodeling surgery]. Rev Esp Anestesiol Reanim2003;50:388-94. Ekbäck G, Axelsson K, Ryttberg L, Edlund B, Kjellberg J, Weckström J, et al. Tranexamic acid reduces blood loss in total hip replacement surgery. Anesth Analg2000;91:1124-30. Elwatidy S, Jamjoom Z, Elgamal E, Zakaria A, Turkistani A, El-Dawlatly A. Efficacy and safety of prophylactic large dose of tranexamic acid in spine surgery: a prospective, randomized, double-blind, placebo-controlled study. Spine2008;33:2577-80. Engel JM, Hohaus T, Ruwoldt R, Menges T, Jürgensen I, Hempelmann G. Regional hemostatic status and blood requirements after total knee arthroplasty with and without tranexamic acid or aprotinin. Anesth Analg2001;92:775-80. Gai MY, Wu LF, Su QF, Tatsumoto K. Clinical observation of blood loss reduced by tranexamic acid during and after caesarian section: a multi-center, randomized trial. Eur J Obstetr Gynecol Reprod Biol2004;112:154-7. Garneti N, Field J. Bone bleeding during total hip arthroplasty after administration of tranexamic acid. J Arthroplasty2004;19:488-92. Gill JB, Chase E, Rosenstein AD. The use of tranexamic acid in revision total hip arthroplasty: a pilot study. Curr Orthop Pract2009;20:152-6. Gobbur VR, Reddy SV, Bijapur UJ. Efficacy of tranexamic acid in reducing blood loss during lower segment caesarean section. 54th All India Congress of Obstetrics and Gynaecology; 5-9 Jan, 2011; Hyderabad, Andhra Pradesh, India. 2011:92. Gohel M, Patel P, Gupta A, Desai P. Efficacy of tranexamic acid in decreasing blood loss during and after cesarean section: a randomized case controlled prospective study. J Obstetr Gynaecol India2007;57:228-30. Goobie SM, Meier PM, Pereira LM, McGowan FX, Prescilla RP, Scharp LA, et al. Efficacy of tranexamic acid in pediatric craniosynostosis surgery: a double-blind, placebo-controlled trial. Anesthesiology2011;114:862-71. Good L, Peterson E, Lisander B. Tranexamic acid decreases external blood loss but not hidden blood loss in total knee replacement. Br J Anaesth2003;90:596-9. Greiff G, Stenseth R, Wahba A, Videm V, Lydersen S, Irgens W, et al. Tranexamic acid reduces blood transfusions in elderly patients undergoing combined aortic valve and coronary artery bypass graft surgery: a randomized controlled trial. J Cardiothorac Vasc Anesth2012;26:232-8. Grundsell H, Larsson G, Bekassy Z. Use of an antifibrinolytic agent (tranexamic acid) and lateral sutures with laser conization of the cervix. Obstet-Gynecol1984;64:573-6. Gungorduk K, Yildirim G, Asicioglu O, Gungorduk OC, Sudolmus S, Ark C. Efficacy of intravenous tranexamic acid in reducing blood loss after elective cesarean section: a prospective, randomized, double-blind, placebo-controlled study. Am J Perinatol2011;28:233-40. Hardy JF, Bélisle S, Dupont C, Harel F, Robitaille D, Roy M, et al. Prophylactic tranexamic acid and epsilon-aminocaproic acid for primary myocardial revascularization. Ann Thorac Surg1998;65:371-6. Hiippala S, Strid L, Wennerstrand M, Arvela V, Mäntylä S, Ylinen J, et al. Tranexamic acid (Cyklokapron) reduces perioperative blood loss associated with total knee arthroplasty. Br J Anaesth1995;74:534-7. Hiippala ST, Strid LJ, Wennerstrand MI, Arvela JV, Niemelä HM, Mäntylä SK, et al. Tranexamic acid radically decreases blood loss and transfusions associated with total knee arthroplasty. Anesth Analg1997;84:839-44. Horrow JC, Hlavacek J, Strong MD, Collier W, Brodsky I, Goldman SM, et al. Prophylactic tranexamic acid decreases bleeding after cardiac operations. J Thorac Cardiovasc Surg1990;99:70-4. Horrow JC, Van Riper DF, Strong MD, Brodsky I, Parmet JL. Hemostatic effects of tranexamic acid and desmopressin during cardiac surgery. Circulation1991;84:2063-70. Horrow JC, Van Riper DF, Strong MD, Grunewald KE, Parmet JL. The dose-response relationship of tranexamic acid. Anesthesiology1995;82:383-92. Husted H, Blønd L, Sonne-Holm S, Holm G, Jacobsen TW, Gebuhr P. Tranexamic acid reduces blood loss and blood transfusions in primary total hip arthroplasty: a prospective randomized double-blind study in 40 patients. Acta Orthopaed Scand2003;74:665-9. Isetta C, Guinness TK, Samat C, Paolini G, Lugrin D, Sanchez B, et al. Antifibrinolytic treatment and homologeous transfusion in cardiac surgery. Eur Heart Surg1993;14(Suppl):424. Jansen AJ, Andreica S, Claeys M, D’Haese J, Camu F, Jochmans K. Use of tranexamic acid for an effective blood conservation strategy after total knee arthroplasty. Br J Anaesth1999;83:596-601. Jares M, Vanek T, Straka Z, Brucek P. Tranexamic acid reduces bleeding after off-pump coronary artery bypass grafting. J Cardiovasc Surg2003;44:205-8. Jimenez JJ, Iribarren JL, Lorente L, Rodriguez JM, Hernandez D, Nassar I, et al. Tranexamic acid attenuates inflammatory response in cardiopulmonary bypass surgery through blockade of fibrinolysis: a case control study followed by a randomized double-blind controlled trial. Crit Care (Lond)2007;11:R117. Johansson T, Pettersson LG, Lisander B. Tranexamic acid in total hip arthroplasty saves blood and money: a randomized, double-blind study in 100 patients. Acta Orthopaed2005;76:314-9. Kakar PN, Gupta N, Govil P, Shah V. Efficacy and safety of tranexamic acid in control of bleeding following TKR: a randomized control trial. Indian J Anaesth2009;53:667-71. Karski J, Djaiani G, Carroll J, Iwanochko M, Seneviratne P, Liu P, et al. Tranexamic acid and early saphenous vein graft patency in conventional coronary artery bypass graft surgery: a prospective randomized controlled clinical trial. J Thorac Cardiovasc Surg2005;130:309-14. Karski JM, Teasdale SJ, Norman P, Carroll J, VanKessel K, Wong P, et al. Prevention of bleeding after cardiopulmonary bypass with high-dose tranexamic acid. Double-blind, randomized clinical trial. J Thorac Cardiovasc Surg1995;110:835-42. Kaspar M, Ramsay MA, Nguyen AT, Cogswell M, Hurst G, Ramsay KJ. Continuous small-dose tranexamic acid reduces fibrinolysis but not transfusion requirements during orthotopic liver transplantation. Anesth Analg1997;85:281-5. Katoh J, Tsuchiya K, Sato W, Nakajima M, Iida Y. Additional postbypass administration of tranexamic acid reduces blood loss after cardiac operations. J Thorac Cardiovasc Surg1997;113:802-4. Katsaros D, Petricevic M, Snow NJ, Woodhall DD, Van Bergen R. Tranexamic acid reduces postbypass blood use: a double-blinded, prospective, randomized study of 210 patients. Ann Thorac Surg1996;61:1131-5. Kazemi SM, Mosaffa F, Eajazi A, Kaffashi M, Besheli LD, Bigdeli MR, et al. The effect of tranexamic acid on reducing blood loss in cementless total hip arthroplasty under epidural anesthesia. Orthopedics2010;33:17. Klinck JR, Boylan JF, Sandler AN, Greig PD, Roger S, Nierenberg H, et al. Tranexamic acid prophylaxis during liver transplantation: a randomized controlled trial [abstract]. Hepatology1993;18:728. Kojima T, Gando S, Morimoto Y, Mashio H, Goda Y, Kawahigashi H, et al. Systematic elucidation of effects of tranexamic acid on fibrinolysis and bleeding during and after cardiopulmonary bypass surgery. Thromb Res2001;104:301-7. Kuitunen A, Hiippala S, Vahtera E, Rasi V, Salmenperä M. The effects of aprotinin and tranexamic acid on thrombin generation and fibrinolytic response after cardiac surgery. Acta Anaesth Scand2005;49:1272-9. Kuitunen AH, Suojaranta-Ylinen RT, Kukkonen SI, Niemi TT. Tranexamic acid does not correct the haemostatic impairment caused by hydroxyethyl starch (200 kDa/0.5) after cardiac surgery. Blood Coagul Fibrinolysis2006;17:639-45. Kulkarni AP, Chaukar MS, Patil V, Divatia J. Does tranexamic acid administration reduce blood loss during head and neck surgery? A prospective randomized double-blind study. ASA Abstracts2011:A484. Later AF, Maas JJ, Engbers FH, Versteegh MI, Bruggemans EF, Dion RA, et al. Tranexamic acid and aprotinin in low- and intermediate-risk cardiac surgery: a non-sponsored, double-blind, randomised, placebo-controlled trial. Eur J Cardiothorac Surg2009;36:322-9. Leelahanon S, Singhatanadgige S, Luengtaviboon K, Cheanvechai C, Benjacholamas V, Namchaisiri J, et al. Can tranexamic acid improve post cardiopulmonary bypass hemostasis? a double-blind prospective randomized placebo-controlled study. Thai J Surg2002;23:138. Lemay E, Guay J, Côté C, Roy A. Tranexamic acid reduces the need for allogenic red blood cell transfusions in patients undergoing total hip replacement. Can J Anaesth2004;51:31-7. Lin PC, Hsu CH, Chen WS, Wang JW. Does tranexamic acid save blood in minimally invasive total knee arthroplasty? Clin Orthop Relat Res2011;469:1995-2002. Macgillivray RG, Tarabichi SB, Hawari MF, Raoof NT. Tranexamic acid to reduce blood loss after bilateral total knee arthroplasty a prospective, randomized double blind study. J Arthroplasty2011;26:24-8. Maddali MM, Rajakumar MC. Tranexamic acid and primary coronary artery bypass surgery: a prospective study. Asian Cardiovasc Thorac Ann2007;15:313-9. Malhotra R. The use of tranexamic acid to reduce blood loss in primary cementless total hip arthroplasty. Eur J Orthop Surg Traumatol2011;21:101-4. Mansour EE, Mustafa B. Aprotinin versus tranexamic acid in patients receiving aspirin and undergoing off-pump coronary artery bypass. Egypt J Anaesth2004;20:229-36. McConnell JS, Shewale S, Munro NA, Shah K, Deakin AH, Kinninmonth AW. Reduction of blood loss in primary hip arthroplasty with tranexamic acid or fibrin spray. Acta Orthop2011;82:660-3. Mehr-Aein A, Davoodi S, Madani-Civi M. Effects of tranexamic acid and autotransfusion in coronary artery bypass. Asian Cardiovasc Thoracic Ann2007;15:49-53. Menichetti A, Tritapepe L, Ruvolo G, Speziale G, Cogliati A, Di Giovanni C, et al. Changes in coagulation patterns, blood loss and blood use after cardiopulmonary bypass: aprotinin vs tranexamic acid vs epsilon aminocaproic acid. J Cardiovasc Surg1996;37:401-7. Miller RA, May MW, Hendry WF, Whitfield HN, Wickham JE. The prevention of secondary haemorrhage after prostatectomy: the value of antifibrinolytic therapy. Br J Urol1980;52:26-8. Misfeld M, Dubbert S, Eleftheriadis S, Siemens HJ, Wagner T, Sievers HH. Fibrinolysis-adjusted perioperative low-dose aprotinin reduces blood loss in bypass operations. Ann Thorac Surg1998;66:792-9. Molloy DO, Archbold HA, Ogonda L, McConway J, Wilson RK, Beverland DE. Comparison of topical fibrin spray and tranexamic acid on blood loss after total knee replacement: a prospective, randomised controlled trial. J Bone Joint Surg Br2007;89:306-9. Moret F, Flo A, Escudero A, Masso E, Munoz S, Ruyra X, et al. Tranexamic acid reduces postoperative bleeding but not allogeneic transfusion requirements in valve replacement cardiac surgery. Transfus Altern Transfus Med2006;8(suppl 1):93. Movafegh A, Eslamian L, Dorabadi A. Effect of intravenous tranexamic acid administration on blood loss during and after cesarean delivery. Int J Gynaecol Obstet2011;115:224-6. Murphy GJ, Mango E, Lucchetti V, Battaglia F, Catapano D, Rogers CA, et al. A randomized trial of tranexamic acid in combination with cell salvage plus a meta-analysis of randomized trials evaluating tranexamic acid in off-pump coronary artery bypass grafting. J Thorac Cardiovasc Surg2006;132:475-80, 80.e1-8. Neilipovitz DT, Murto K, Hall L, Barrowman NJ, Splinter WM. A randomized trial of tranexamic acid to reduce blood transfusion for scoliosis surgery. Anesth Analg2001;93:82-7. Niskanen RO, Korkala OL. Tranexamic acid reduces blood loss in cemented hip arthroplasty: a randomized, double-blind study of 39 patients with osteoarthritis. Acta Orthopaed2005;76:829-32. Nuttall GA, Oliver WC, Ereth MH, Santrach PJ, Bryant SC, Orszulak TA, et al. Comparison of blood-conservation strategies in cardiac surgery patients at high risk for bleeding. Anesthesiology2000;92:674-82. Oertli D, Laffer U, Haberthuer F, Kreuter U, Harder F. Perioperative and postoperative tranexamic acid reduces the local wound complication rate after surgery for breast cancer. Br J Surg1994;81:856-9. Orpen NM, Little C, Walker G, Crawfurd EJ. Tranexamic acid reduces early post-operative blood loss after total knee arthroplasty: a prospective randomised controlled trial of 29 patients. Knee2006;13:106-10. Ozal E, Kuralay E, Bingöl H, Cingöz F, Ceylan S, Tatar H. Does tranexamic acid reduce desmopressin-induced hyperfibrinolysis? J Thorac Cardiovasc Surg2002;123:539-43. Penta de Peppo A, Pierri MD, Scafuri A, De Paulis R, Colantuono G, Caprara E, et al. Intraoperative antifibrinolysis and blood-saving techniques in cardiac surgery. Prospective trial of 3 antifibrinolytic drugs. Tex Heart Inst J1995;22:231-6. Pfizer. Study of tranexamic acid for the reduction of blood loss in patients undergoing surgery for long bone fracture. 2011. http://clinicaltrials.gov/ct2/show/results/NCT00824564?sect=X6015#outcome1. Pinosky ML, Kennedy DJ, Fishman RL, Reeves ST, Alpert CC, Ecklund J, et al. Tranexamic acid reduces bleeding after cardiopulmonary bypass when compared to epsilon aminocaproic acid and placebo. J Cardiac Surg1997;12:330-8. Pleym H, Stenseth R, Wahba A, Bjella L, Karevold A, Dale O. Single-dose tranexamic acid reduces postoperative bleeding after coronary surgery in patients treated with aspirin until surgery. Anesth Analg2003;96:923-8. Pugh SC, Wielogorski AK. A comparison of the effects of tranexamic acid and low-dose aprotinin on blood loss and homologous blood usage in patients undergoing cardiac surgery. J Cardiothorac Vasc Anesth1995;9:240-4. Rannikko A, Pétas A, Taari K. Tranexamic acid in control of primary hemorrhage during transurethral prostatectomy. Urology2004;64:955-8. Reid RW, Zimmerman AA, Laussen PC, Mayer JE, Gorlin JB, Burrows FA. The efficacy of tranexamic acid versus placebo in decreasing blood loss in pediatric patients undergoing repeat cardiac surgery. Anesth Analg1997;84:990-6. Risch A, Dorscheid E, Stein G, Seyfert UT, Grundmann U. [The effect of aprotinin and tranexamic acid on fibrinolysis and thrombin generation during cardiopulmonary bypass]. [German]. Anaesthesist2000;49:279-85. Rybo G, Westerberg H. The effect of tranexamic acid (AMCA) on postoperative bleeding after conization. Acta Obstetr Gynecol Scand1972;51:347-50. Sadeghi M, Mehr-Aein A. Does a single bolus dose of tranexamic acid reduce blood loss and transfusion requirements during hip fracture surgery? A prospective randomized double blind study in 67 patients. Acta Med Iranica2007;45:437-42. Santos AT, Kalil RA, Bauemann C, Pereira JB, Nesralla IA. A randomized, double-blind, and placebo-controlled study with tranexamic acid of bleeding and fibrinolytic activity after primary coronary artery bypass grafting. Braz J Med Biol Res2006;39:63-9. Sekhavat L, Tabatabaii A, Dalili M, Farajkhoda T, Tafti AD. Efficacy of tranexamic acid in reducing blood loss after cesarean section. J Matern Fetal Neonatal Med2009;22:72-5. Sethna NF, Zurakowski D, Brustowicz RM, Bacsik J, Sullivan LJ, Shapiro F. Tranexamic acid reduces intraoperative blood loss in pediatric patients undergoing scoliosis surgery. Anesthesiology2005;102:727-32. Shore-Lesserson L, Reich DL, Vela-Cantos F, Ammar T, Ergin MA. Tranexamic acid reduces transfusions and mediastinal drainage in repeat cardiac surgery. Anesth Analg1996;83:18-26. Sorin A, Claeys MA, Jansen A, D’Haese J, Camu F. Reduction of blood loss by tranexamic acid in total knee replacement. J Bone Joint Surg Br1999;81-B(suppl.II):234. Speekenbrink RG, Vonk AB, Wildevuur CR, Eijsman L. Hemostatic efficacy of dipyridamole, tranexamic acid, and aprotinin in coronary bypass grafting. Ann Thorac Surg1995;59:438-42. Taghaddomi RJ, Mashhadinezhad H, Attar ARS, Peivandi A. The effect of intravenous tranexamic acid on blood loss in lumbar hernial disc resection under inhalation and total intravenous anesthesia. Iran Red Crescent Med J2009;11:265-70. Taghaddomi RJ, Mirzaee A, Attar AS, Shirdel A. Tranexamic acid reduces blood loss in off-pump coronary artery bypass surgery. J Cardiothorac Vasc Anesth2009;23:312-5. Tanaka N, Sakahashi H, Sato E, Hirose K, Ishima T, Ishii S. Timing of the administration of tranexamic acid for maximum reduction in blood loss in arthroplasty of the knee. J Bone Joint Surg Br2001;83:702-5. Tsutsumimoto T, Shimogata M, Ohta H, Yui M, Yoda I, Misawa H. Tranexamic acid reduces perioperative blood loss in cervical laminoplasty: a prospective randomized study. Spine (Phila Pa 1976)2011;36:1913-8. Uozaki Y, Watanabe G, Kotou K, Ueyama K, Doi Y, Misaki T. Effect of tranexamic acid on blood loss reduction after cardiopulmonary bypass. Jap J Thorac Cardiovasc Surg2001;49:273-8. Vanek T, Jares M, Fajt R, Straka Z, Jirasek K, Kolesar M, et al. Fibrinolytic inhibitors in off-pump coronary surgery: a prospective, randomized, double-blind TAP study (tranexamic acid, aprotinin, placebo). Eur J Cardiothorac Surg2005;28:563-8. Veien M, Sørensen JV, Madsen F, Juelsgaard P. Tranexamic acid given intraoperatively reduces blood loss after total knee replacement: a randomized, controlled study. Acta Anaesth Scand2002;46:1206-11. Wang G, Xie G, Jiang T, Wang Y, Wang W, Ji H, et al. Tranexamic acid reduces blood loss after off-pump coronary surgery: a prospective, randomized, double-blind, placebo-controlled study. Anesth Analg2011; published online 7 Jul. Wei M, Jian K, Guo Z, Wang L, Jiang D, Zhang L, et al. Tranexamic acid reduces postoperative bleeding in off-pump coronary artery bypass grafting. Scand Cardiovasc J2006;40:105-9. Wong J, El Beheiry H, Rampersaud YR, Lewis S, Ahn H, De Silva Y, et al. Tranexamic acid reduces perioperative blood loss in adult patients having spinal fusion surgery. Anesth Analg2008;107:1479-86. Wu CC, Ho WM, Cheng SB, Yeh DC, Wen MC, Liu TJ, et al. Perioperative parenteral tranexamic acid in liver tumor resection: a prospective randomized trial toward a “blood transfusion”-free hepatectomy. Ann Surg2006;243:173-80. Yang H, Zheng S, Shi C. [Clinical study on the efficacy of tranexamic acid in reducing postpartum blood lose: a randomized, comparative, multicenter trial]. Zhonghua Fu Chan Ke Za Zhi2001;36:590-2. Yassen K, Bellamy MC, Sadek SA, Webster NR. Tranexamic acid reduces blood loss during orthotopic liver transplantation. Clin Transplant1993;7:453-8. Yepes JF. Use of tranexamic acid during oral surgery in patients receiving anticoagulant therapy. (Abstract 56th Annual Meeting AAOM). Oral Surg Oral Med Oral Pathol Oral Radiol Endod2002;93:419. Zabeeda D, Medalion B, Sverdlov M, Ezra S, Schachner A, Ezri T, et al. Tranexamic acid reduces bleeding and the need for blood transfusion in primary myocardial revascularization. Ann Thorac Surg2002;74:733-8. Zhang F, Gao Z, Yu J. [Clinical comparative studies on effect of tranexamic acid on blood loss associated with total knee arthroplasty]. [Chinese]. Chung-Kuo Hsiu Fu Chung Chien Wai Ko Tsa Chih2007;21:1302-4. Zheng SR, Chi GZ. Effects of tranexamic acid on decreasing blood loss within two hours after delivery. A multicenter randomized comparative study. Blood2000;96:846a. Zohar E, Ellis M, Ifrach N, Stern A, Sapir O, Fredman B. The postoperative blood-sparing efficacy of oral versus intravenous tranexamic acid after total knee replacement. Anesth Analg2004;99:1679-83. Zonis Z, Seear M, Reichert C, Sett S, Allen C. The effect of preoperative tranexamic acid on blood loss after cardiac operations in children. J Thorac Cardiovasc Surg1996;111:982-7. Zufferey PJ, Miquet M, Quenet S, Martin P, Adam P, Albaladejo P, et al. Tranexamic acid in hip fracture surgery: a randomized controlled trial. Br J Anaesth2010;104:23-30. Aspirin and tranexamic acid for coronary artery surgery-ATACAS (ACTRN12605000557636) www.anzctr.org.au/trial_view.aspx?id=789. Blood loss and transfusion requirement in infants treated with tranexamic acid (NCT01094977) http://clinicaltrials.gov/ct2/show/NCT01094977. Fibrin glue or tranexamic acid for total knee arthroplasty-ATRHEMOS (NCT01306370) http://clinicaltrials.gov/ct2/show/NCT01306370. Hemostatic and anti-inflammatory effects of ulinastatin and tranexamic acid in cardiopulmonary bypass cardiac surgery (NCT01060189) http://clinicaltrials.gov/ct2/show/NCT01060189. Impact of tranexamic acid on red blood cell transfusion in spinal surgery (NCT01258010) http://clinicaltrials.gov/ct2/show/NCT01258010. Tranexamic acid (TXA) versus epsilon aminocaproic acid (EACA) versus placebo for spine surgery (NCT00958581) http://clinicaltrials.gov/ct2/show/NCT00958581. intravenous tranexamic acid and intraoperative visualization during functional endoscopic sinus surgery (NCT01111669) http://clinicaltrials.gov/ct2/show/NCT01111669. Multicenter, randomized placebo-controlled clinical trial to evaluate the effect of perioperative use of tranexamic acid on transfusion requirements and surgical bleeding in major spine surgery (NCT01136590) http://clinicaltrials.gov/ct2/show/NCT01136590. Non-idiopathic scoliosis treated with tranexamic acid (NCT01089140) http://clinicaltrials.gov/ct2/show/NCT01089140. Search for optimum dose and timing of tranexamic acid administration in cardiac surgery with cardiopulmonary bypass (JPRN-UMIN000003327) http://apps.who.int/trialsearch/trial.aspx?trialid=JPRN-UMIN000003327. Tranexamic acid for craniofacial surgery (NCT00722436) http://clinicaltrials.gov/ct2/show/NCT00722436. Tranexamic acid in surgery of advanced ovarian cancer (NCT00740116) http://clinicaltrials.gov/ct2/show/NCT00740116. Tranexamic acid on blood loss and transfusion in cardiac surgery (NCT01060176) http://clinicaltrials.gov/ct2/show/NCT01060176. Tranexamic acid versus placebo to reduce perioperative bleeding after major hepatectomy (NCT00657384) http://clinicaltrials.gov/ct2/show/NCT00657384. Adler Ma SC, Brindle W, Burton G, Gallacher S, Hong FC, Manelius I, et al. Tranexamic acid is associated with less blood transfusion in off-pump coronary artery bypass graft surgery: a systematic review and meta-analysis. J Cardiothorac Vasc Anesth2011;25:26-35. Alshryda S, Sarda P, Sukeik M, Nargol A, Blenkinsopp J, Mason JM. Tranexamic acid in total knee replacement: a systematic review and meta-analysis. J Bone Joint Surg Br2011;93:1577-85. Barrons RW, Jahr JS. A review of post-cardiopulmonary bypass bleeding, aminocaproic acid, tranexamic acid, and aprotinin. Am J Ther1996;3:821-38. Brown JR, Birkmeyer NJ, O’Connor GT. Meta-analysis comparing the effectiveness and adverse outcomes of antifibrinolytic agents in cardiac surgery. Circulation2007;115:2801-13. Cid J, Lozano M. Tranexamic acid reduces allogeneic red cell transfusions in patients undergoing total knee arthroplasty: results of a meta-analysis of randomized controlled trials. Transfusion2005;45:1302-7. Elgafy H, Bransford RJ, McGuire RA, Dettori JR, Fischer D. Blood loss in major spine surgery: are there effective measures to decrease massive hemorrhage in major spine fusion surgery? Spine (Phila Pa 1976)2010;35(suppl 9):S47-56. Erstad BL. Antifibrinolytic agents and desmopressin as hemostatic agents in cardiac surgery. Ann Pharmacother2001;35:1075-84. Erstad BL. Systemic hemostatic medications for reducing surgical blood loss. Ann Pharmacother2001;35:925-34. Fremes SE, Wong BI, Lee E, Mai R, Christakis GT, McLean RF, et al. Metaanalysis of prophylactic drug treatment in the prevention of postoperative bleeding. Ann Thorac Surg1994;58:1580-8. Gill JB, Chin Y, Levin A, Feng D. The use of antifibrinolytic agents in spine surgery. A meta-analysis. J Bone Joint Surg Am2008;90:2399-407. Gill JB, Rosenstein A. The use of antifibrinolytic agents in total hip arthroplasty: a meta-analysis. J Arthroplasty2006;21:869-73. Guay J, de Moerloose P, Lasne D. Minimizing perioperative blood loss and transfusions in children. Can J Anaesth2006;53(suppl 6):S59-67. Gurusamy KS, Li J, Sharma D, Davidson BR. Pharmacological interventions to decrease blood loss and blood transfusion requirements for liver resection. Cochrane Database Syst Rev2009(4):CD008085. Ho KM, Ismail H. Use of intravenous tranexamic acid to reduce allogeneic blood transfusion in total hip and knee arthroplasty: a meta-analysis. Anaesth Intensive Care2003;31:529-37. Kagoma YK, Crowther MA, Douketis J, Bhandari M, Eikelboom J, Lim W. Use of antifibrinolytic therapy to reduce transfusion in patients undergoing orthopedic surgery: a systematic review of randomized trials. Thromb Res2009;123:687-96. Kongnyuy EJ, Wiysonge CS. Interventions to reduce haemorrhage during myomectomy for fibroids. Cochrane Database Syst Rev2009(3):CD005355. Laupacis A, Fergusson D. Drugs to minimize perioperative blood loss in cardiac surgery: meta-analyses using perioperative blood transfusion as the outcome. The International Study of Peri-operative Transfusion (ISPOT) Investigators. Anesth Analg1997;85:1258-67. Levi M, Cromheecke ME, de Jonge E, Prins MH, de Mol BJ, Briet E, et al. Pharmacological strategies to decrease excessive blood loss in cardiac surgery: a meta-analysis of clinically relevant endpoints. Lancet1999;354:1940-7. Liu JM, Peng HM, Shen JX, Qiu GX. [A meta-analysis of the effectiveness and safety of using tranexamic acid in spine surgery]. Zhonghua Wai Ke Za Zhi2010;48:937-42. Makwana J, Paranjape S, Goswami J. Antifibrinolytics in liver surgery. Indian J Anaesth2010;54:489-95. Martin-Hirsch PP, Keep SL, Bryant A. Interventions for preventing blood loss during the treatment of cervical intraepithelial neoplasia. Cochrane Database Syst Rev2010(6):CD001421. Molenaar IQ, Warnaar N, Groen H, Tenvergert EM, Slooff MJ, Porte RJ. Efficacy and safety of antifibrinolytic drugs in liver transplantation: a systematic review and meta-analysis. Am J Transplant2007;7:185-94. Ngaage DL, Bland JM. Lessons from aprotinin: is the routine use and inconsistent dosing of tranexamic acid prudent? 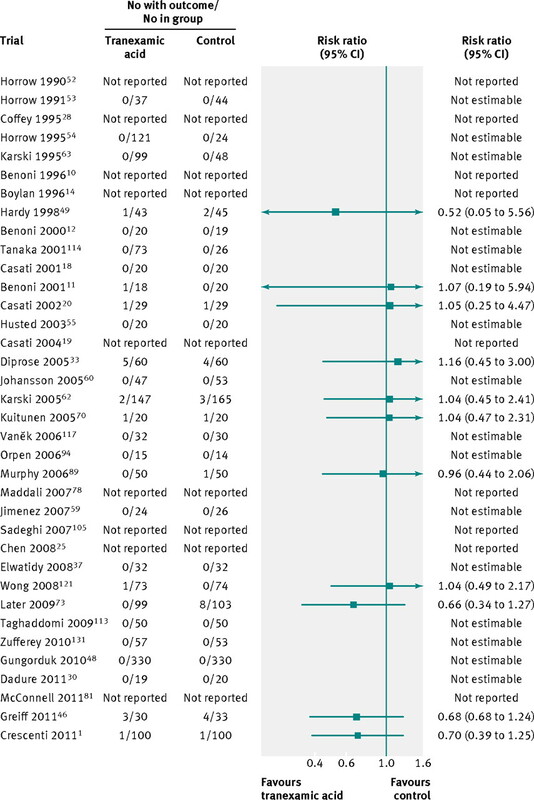 Meta-analysis of randomised and large matched observational studies. Eur J Cardiothorac Surg2010;37:1375-83. Novikova N, Hofmeyr GJ. Tranexamic acid for preventing postpartum haemorrhage. Cochrane Database Syst Rev2010(7):CD007872. Schouten ES, van de Pol AC, Schouten AN, Turner NM, Jansen NJ, Bollen CW. The effect of aprotinin, tranexamic acid, and aminocaproic acid on blood loss and use of blood products in major pediatric surgery: a meta-analysis. Pediatr Crit Care Med2009;10:182-90. Sukeik M, Alshryda S, Haddad FS, Mason JM. 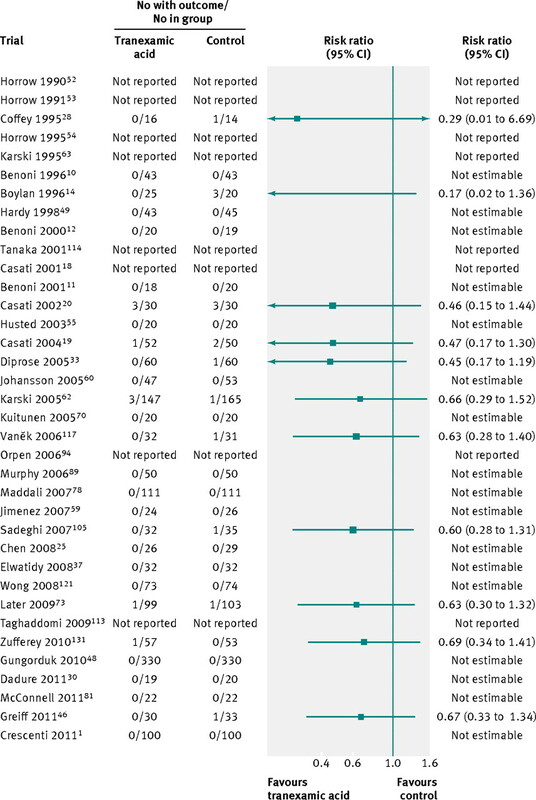 Systematic review and meta-analysis of the use of tranexamic acid in total hip replacement. J Bone Joint Surg Br2011;93:39-46. Tzortzopoulou A, Cepeda MS, Schumann R, Carr DB. Antifibrinolytic agents for reducing blood loss in scoliosis surgery in children. Cochrane Database Syst Rev2008(3):CD006883. Umscheid CA, Kohl BA, Williams K. Antifibrinolytic use in adult cardiac surgery. Curr Opin Hematol2007;14:455-67. Zhang H, Chen J, Chen F, Que W. The effect of tranexamic acid on blood loss and use of blood products in total knee arthroplasty: a meta-analysis. Knee Surg Sports Traumatol Arthrosc2011; published online 8 Nov.
Zufferey P, Merquiol F, Laporte S, Decousus H, Mismetti P, Auboyer C, et al. Do antifibrinolytics reduce allogeneic blood transfusion in orthopedic surgery? Anesthesiology2006;105:1034-46. Ioannidis JP, Lau J. Completeness of safety reporting in randomized trials: an evaluation of 7 medical areas. JAMA2001;285:437-43. Loke YK, Derry S. Reporting of adverse drug reactions in randomised controlled trials—a systematic survey. BMC Clin Pharmacol2001;1:3. The CRASH-2 Collaborators. Effects of tranexamic acid on death, vascular occlusive events, and blood transfusion in trauma patients with significant haemorrhage (CRASH-2): a randomised, placebo-controlled trial. Lancet2010;376:23-32. Myles PS, Smith J, Knight J, Cooper DJ, Silbert B, McNeil J, et al. Aspirin and Tranexamic Acid for Coronary Artery Surgery (ATACAS) Trial: rationale and design. Am Heart J2008;155:224-30.